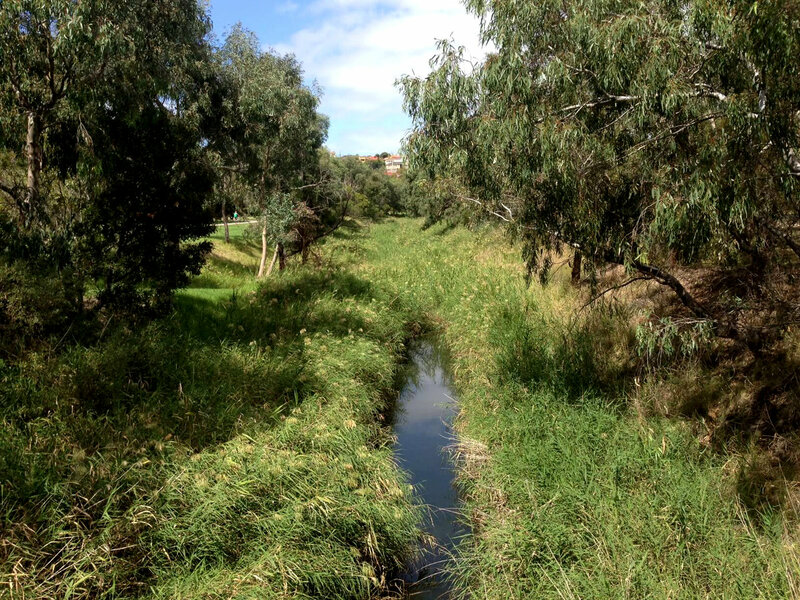 Moonee Ponds Creek drains an area of approximately 145 square kilometres. The catchment extends from Greenvale through parts of Broadmeadows, Glenroy, Essendon and Moonee Ponds, before flowing southward through Flemington, Kensington, North and West Melbourne into the Yarra River. The catchment is almost all urbanised and housing developments continue to expand across the remaining pastoral land in the upper catchment. Essendon Airport and approximately half of Melbourne Airport are also located within the Moonee Ponds catchment. The origin of the name of the Moonee Ponds Creek is thought most likely to be derived from the aboriginal name as the Moonee Moonee chain of ponds, first referred to by Hoddle in 1837 and on early settlement maps. Once described by The Age as “arguably the most abused tributary of the Yarra River, and part of the true underside of Melbourne”, removal of noxious industries, sewerage and drainage works by the MMBW and from the 1970s, the continued efforts of groups such as the Friends of Moonee Ponds Creek have seen the banks revegetated with native plants and the return of wildlife such as the pobblebonk frog and nankeen night heron. A shared pathway for walkers, runners and cyclists, the Moonee Ponds Creek Trail, runs the entire length of the Creek from the Woodlands Homestead in the Woodlands Historic Park down to Docklands. Originally, the Creek had shallow ponds of water that formed a chain along the length of the watercourse, isolated in drier times of the year, and flowing in the wetter months after heavy rains. These environments would have provided a water source as well as abundant plant and wildlife resources. Eels and Murnong (Yam Daisy) appear to have been prominent resources along the creek. As well as these food resources, there were camp locations on the nutrient rich flood plains that, at certain times of the year would have encouraged the Aboriginal people to take advantage of its seasonal bounty. When Europeans first settled the Port Phillip region, five Aboriginal language groups, part of the Kulin (Koolin) Nation, already occupied it. Consisting of multiple land-caring units, these clans were connected through cultural and mutual interests, totems, trading initiatives and marital rites. The local clan, the Gunung (meaning “creek dwelling people”) were connected to the Moonee Ponds Creek and other waterways in the area. There is still evidence of Aboriginal occupation at the Woodlands Historic Park. Scattered through the Park are scarred trees and surface stone tool scatters; and an occupation site is also listed in the park. Other resources within the park which would have been used by the Aborigines include kangaroos and possums, birdlife including water fowl and plant foods such as Yam Daisy, tubers and gum resins. A stone tool has also been found in Royal Park, near the old course of the Creek. The first land sales in the area of Strathmore on Moonee Ponds Creek were made in 1843 and 1845. Between 1940 and the 1980s the Melbourne Metropolitan Board of Works, now called Melbourne Water, realigned and concreted the Creek from Strathmore to Flemington Road, in an attempt to stop periodical flooding. The modifications were part of extensive urban development of the lower floodplain. For much of its length through the northern suburbs the Creek is now characterised as a concrete stormwater drain that parallels the Tullamarine Freeway/CityLink. Plants play a vital role. They help to prevent erosion of the Creek’s banks and provide shelter and food for the Creek’s birds and other fauna. The plants also provided food, medicine and raw materials for tools for the Kulin people. A wide number of plants grow along and in the Creek including local indigenous species such as Kangaroo Grass, a number of Acacias and the iconic River Red Gum. Problematic woody weeds, such as Boxthorn, Prickly Pear and Ash are slowly being eliminated. The Moonee Ponds Creek supports a wide variety of of birds and animals. The Creek provides an important corridor connecting woodlands, wetlands and riparian zones from its origins near Oaklands Junction to its tidal reaches closer to the Yarra River. Revegetation along the Creek corridor increases its biodiversity and habitat value for fauna and creates important biolinks with neighbouring reserves. The following footage was commissioned by Melbourne Water to provide the community with an overview of the diversity of the environment and land use throughout the catchment. For more information on Moonee Ponds Creek visit Melbourne Water’s website. A quick tour of the Moonee Ponds Creek Catchment from the farmland of Yuroke, through Woodlands Historic Park, past Melbourne Airport and the Greenvale Reservoir, before making its way through the suburbs and ending at the Bolte Bridge where it flows into the Yarra River. This Catchment has a diverse landscape surrounding it, as we travel along the length of the Moonee Ponds Creek and its smaller tributaries you can see it provides a place for recreation, wildlife and nature. The video shows that there are a large number of birds and animals that call it home as well as residents that utilise the many paths and parkland for fitness, recreation and just relaxation. The northern section of Moonee Ponds Creek starts in paddocks around Dunhelens lane, Yuroke and travels through farmland and past the new estates before entering the Woodlands Historic Park. It then makes it way past Melbourne International Airport before it then weaves itself through the houses in Westmeadows. The Yuroke Creek enters the waterway just above the Jacana Wetlands. This video stops in the Jacana Wetlands as the creek passes under the Western Ring road. The Moonee Ponds Creek Catchment begins to the north of Tullamarine Airport in farmland. The creek itself then meanders through Woodlands Historic Park and suburbs such as Westmeadows, Jacana, Strathmore Heights, Oak Park, Pascoe Vale South, Essendon, Brunswick West, Moonee Ponds, Flemington, North Melbourne and Kensington, before meeting the confluence with the Yarra River at Docklands, under the Bolte Bridge. This video focuses on the Southern Section of the creek starting at the Jacana Retarding Basin Gowanbrae where flanked by parkland, walking and bike tracks it flows south through residential areas into the heavily built up areas of West Melbourne before joining the Yarra River at Docklands, under the Bolte Bridge. This video of Moonee Ponds Creek starts at the Yarra River and works its way upstream to Racecourse Road, Flemington. The section of the video shows the creek meandering its way through the most industrial section of its entire length. It changes in width many times and from natural waterway to concrete channel in sections. Throughout the video the habitat that it provides for the wildlife, particularly birds can be seen. Additionally the bike and walking paths that run along the creek provide a place for residents to get out and engage with the creek as well as a highway of travel during peak times for commuters to make their way to and from work.